In a short poem written by April, 1915, Moore saluted Traherne’s editor; “Like Bertram Dobell, you Achieve Distinction by Disclaiming It. [sic]” is the manuscript version of the title (See Schulman’s edition of Poems, p. 63, for the printed version). 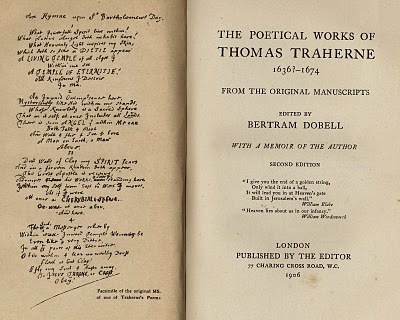 Dobell had the good fortune to come upon Traherne’s manuscripts, previously credited to Henry Vaughan, but unpublished. 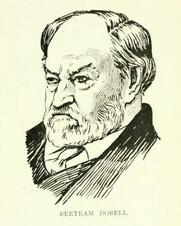 An antiquarian bookseller and scholar housed in London’s famous bookish street, Dobell came to Moore’s notice when he published an article on “The Earliest Poems of Robert Browning” in The Cornhill Magazine for January, 1914 (Moore makes a note of this article in a small ring notebook containing alphabetical entries of writiers and writing). While we cannot be sure that she actually read this piece before she wrote the poem, we do know that she already owned Centuries of Meditations edited by Dobell. All that is great or high in Blessedness. The other were occasioned by the fall. It would be pleasing to think that when in London in 1911, Moore made her way to 77 Charing Cross Road and met the modest Dobell himself. It would be interesting to know for certain whether Moore meant to honor Traherne as well as his editor. Marianne Moore: a Presbyterian Poet? Road to Paradise: Moore's "Octopus"
White: "Morals, Manners, and 'Marriage': Marianne Moore's Art of Conversation."